Responsive Phase. Still Image = This is where a short action is made and then it goes into a still image. The members of one group are acting whilst in a still motion. This can be used to focus on one particular scene that might be confusing or hard to follow. It can also be used to show different levels, status or particular theme. It can also be used to be more imaginative than basing it on fact. 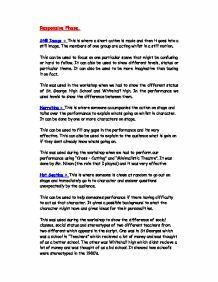 This was used in the workshop when we had to show the different status of St. George High School and Whitehall high. In the performance we used levels to show the difference between them. Narrating = This is where someone accumpanies the action on stage and talks over the performance to explain whats going on whilst in character. It can be done by one or more characters on stage. This can be used to fill any gaps in the performance and its very effective. This can also be used to explain to the audience what is goin on if they dont already know whats going on. ...read more. The characters had to show stereotypes that other people might of presumed of them. We also had to do "thought tracking" because the characters acted as if they didnt care but when they were thought tracked it showed that all of them did care but they couldn't show it because of what their peers might think and because of the lack of funds at their school. Cross Cutting = This is where there is an obvious change of character, setting or change of scenes and go back and forward to differnt dramatic moments This can be used as a flaskback in a certain characters life and it can be used to explain to the audience why a certain moment is happening to a charater. This can also be used for irony or something that they say or do. In the worshop, I used this to show three different scenes in the "Teechers" script. The method I used was I took a scene from act one and made it to look like the start of my performance and then cross - cutted my scenes to Act three and then back to act two to make it the end of my performance. ...read more. are unfairly treated I also used multi roleplay in the "cross cutting" perfrmance where, from "Teechers", I had to take on the roles as Mr. Nixon and Salty. Forum Theatre - This is where a scene is enacted and watched by the rest of the group. At any point during the scene, any actor or member of the audience can stop the drama to ask for help or make a suggestion. Observers can join in by suggesting a new role or by taking over an existing one. This can be used as exploring an issue in a particular piece and it can new ideas for going round the issue and it can come to good use when someone comes to perform. This was used during the workshop to show a little incident going on when the drama theatre at Whitehall High in "Teechers" had to be used for more than one purpose. Some people went in as students, some as caretakers and some as teachers at that school. It really helped during the performance that I had to do and gave me a lot more ideas. ...read more. Our other section we choose includes a school disco and we wanted to do this as we thought we could really show the comedy side to the play by acting out this part and challenge our physical skills. 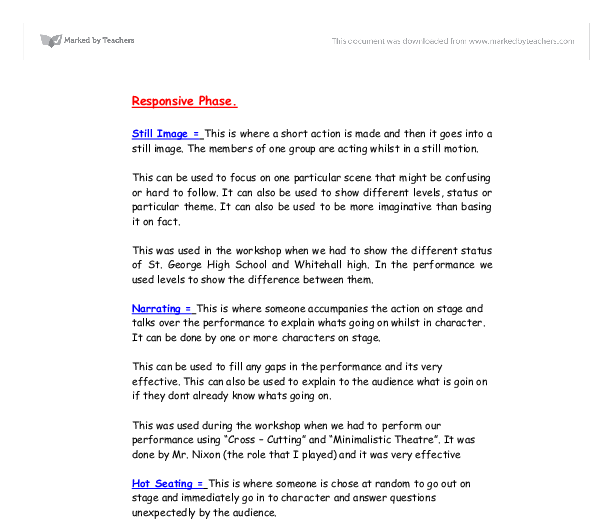 audience viewpoint clear and direct at the stage and not the storyline. How effective did you feel that these skills/techniques were in communicating ideas to the audience? I believe that the communication between the performers and the audience was the key to success for Faustus. The rhythm and tempo within the dance and music was very important. I think that rhythm of the music ignited a sense of feeling and atmosphere because we built up a climax. We did this by speeding up the tempo and raising the pitch in the dramatic parts of the song. The lady in the picture could've been thinking this - her body language certainly suggests this - she is hunched up, as if she has a huge burden on her shoulders, or the 'weight of the world' has really got her down. This helps the audience understand what is going on. The effect it has on the atmosphere because I think it brings the play to life. It also has the effect of showing what the character is going through and changes the whole mood of the play.